Israeli cities ban Arab Palestinian school workers from showing up for jobs. 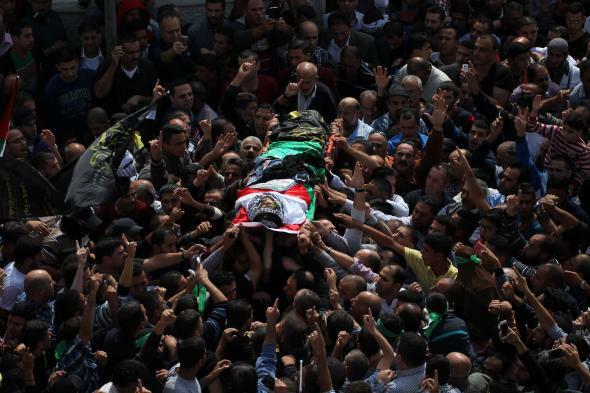 Palestinians take part in the funeral of 19-year-old Mohannad Halabi in the West Bank village of Surda, near Ramallah, on October 9, 2015. A disturbing story from Reuters out of Israel on Sunday reports that four cities in Israel, including financial capital Tel Aviv, have temporarily banned Arab workers employed in schools from their jobs after a series of stabbing attacks and reprisals by security forces has the country on edge. “Israel’s Interior Ministry, which oversees the municipalities, said it appealed to ‘all mayors to continue to act with respect and equality towards all their workers, irrespective of religion, ethnicity or gender,’ [but] it did not ask them to repeal the restrictions,” Reuters notes. “Seven Israelis have been killed this month by assailants using mostly kitchen knives, but also guns,” the New York Times reports. “At least 16 suspected assailants have been shot dead, and more than 20 Palestinians have been killed in clashes with Israeli security forces.” The recent wave of Palestinian anger was triggered by what they see as Israeli encroachment at the al-Aqsa mosque compound, on what Jews call the Temple Mount. The Israeli government has increased security measures in Jerusalem, including new stop-and-frisk provisions that allow security forces almost absolute discretion. Earlier this month, Prime Minister Benjamin Netanyahu announced a security policy allowing for “administrative detention,” or jailing without trial, of terrorist suspects.